Grady Productions is a student-staffed video production service for the University of Georgia and Athens, Georgia area. Our function is to provide quality video services while giving Grady College students the opportunity to gain real-world experience. 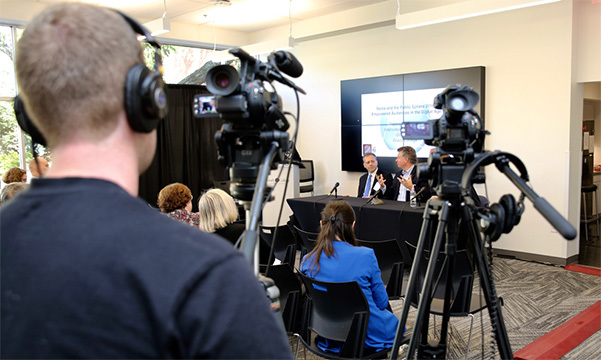 Our students will earn a modest income and offer UGA & Athens affordable video solutions. While our students are the driving force of Grady Productions, a veteran instructional staff can provide years of experience to assist students with scripting, production-day recording, and post-production editing & graphics. Contact Jim Black at jimblack@uga.edu for details or to ask questions about hiring Grady Productions for your television production needs.